Advancements in aesthetic medicine have made it possible to improve the appearance of the nose without invasive surgery. Non-surgical rhinoplasty is an attractive alternative for many men and women who are unhappy with cosmetic imperfections of the nose but want to avoid surgical rhinoplasty. While traditionally this procedure has been performed with temporary dermal fillers, our Beverly Hills practice offers a permanent solution: Silikon 1000. Silikon 1000 is a permanent filler made from safe, medical-grade liquid silicone. As a leading rhinoplasty superspecialist, Dr. Robert Kotler has a proven track record of patient satisfaction with permanent non-surgical rhinoplasty. Contact us at (310) 278-8721 to get started on your customized treatment plan by Beverly Hills’ leading rhinoplasty superspecialist. What Can Non-Surgical Rhinoplasty Treat? This quick procedure is a great option for treating minor cosmetic nasal flaws. It cannot make the nose smaller or alter its internal structures. For patients who need significant structural changes to the nose, surgical rhinoplasty is a more appropriate choice. At your initial consultation, Dr. Kotler will help you fully explore your options and discover which procedure would best meet your expectations and preferences. What makes our practice stand out is our commitment to patient satisfaction and dedication to advancing the field of cosmetic nose surgery. One technique, of many, Dr. Kotler is known for is the Kotler Saline Demo. This allows patients to see the results they can achieve with non-surgical rhinoplasty before making the final decision. During this short procedure, Dr. Kotler injects sterile salt water under the skin with a very fine needle. This mimics the eventual results that can be achieved with the permanent filler. Within about two hours, the saline is safely absorbed by the body. Dr. Kotler will photograph the results, so patients can take their time and feel confident with their decision. Our team will also email the pictures to the patients, so they can evaluate their new appearance from the comfort of their homes and determine if they like the new shape of their nose. We want patients to have every opportunity to think about the aesthetic changes and evaluate what they want their new facial and nasal profile to look like. We understand it’s easy to be giddy about potential changes while sitting in a cosmetic surgeon’s office, but by looking at the demo pictures from home, patients can truly examine the results from every angle and with a different perspective. The entire procedure takes less than 30 minutes to perform and is virtually painless. A prescription-strength anesthetic cream is applied to the skin before the injections to ensure patient comfort. After the treatment area has been anesthetized, Dr. Kotler will begin the injections. He uses a highly specialized microdroplet technique, which involves injecting permanent filler just under the skin. In response to the filler, the body creates a microscopic wall of natural tissue, which makes the enhancements permanent. For the most precise application of permanent filler, Dr. Kotler uses a very fine needle that has the thickness of about six human hairs. This meticulous technique allows Dr. Kotler to produce superior, natural-looking results that last. Non-surgical rhinoplasty requires absolutely no downtime. After the treatment, patients can resume their busy schedule. Most patients don’t even experience swelling or bruising after the procedure. It’s common for patients to require three treatments spaced about six weeks apart to achieve optimal results. This incremental approach allows Dr. Kotler to avoid the possibility of overfilling or overcorrecting the treated area. While most cosmetic surgeons use temporary fillers for this procedure, this approach requires patients to come back to maintain their results regularly. With permanent non-surgical rhinoplasty, patients can achieve permanent results. Does Silikon 1000 move under the skin? No, the essence of the procedure is using micro-droplets placed just beneath the skin. The droplets are immediately walled off and trapped by nature’s healing process. Nor is the effect like a solid implant in which some potential for movement exists. Can I have rhinoplasty after having silicone treatments? Is it possible that one could develop an infection from the injection? Yes, there is always a possibility of infection with any procedure, but not likely. What is the Saline demo in non-surgical rhinoplasty? The saline demo is an opportunity for patients to see the results of permanent non-surgical rhinoplasty before having the actual procedure done. Saline solution is injected into the nose to mimic the results of the Silikon 1000. The body safely absorbs the saline solution within two hours. Dr. Kotler understands that being unsatisfied with your nose can keep you from living confidently. He is inspired by the transformative effects a non-surgical nose job can have, and he truly enjoys collaborating with patients to create their customized treatment plan. 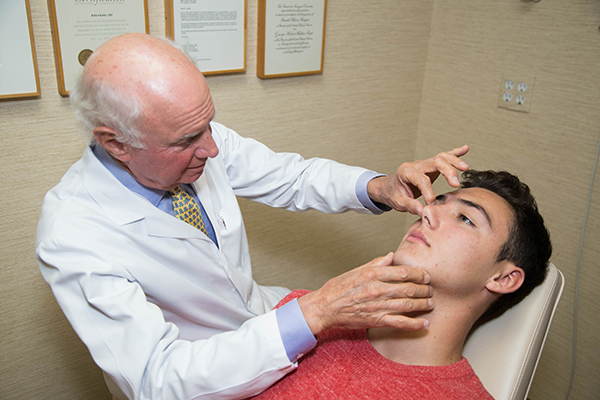 Whether you’d like to refine your profile, build up your nasal bridge, or lift a drooping nasal tip, Dr. Kotler can help you reach your cosmetic goals. Those considering non-surgical rhinoplasty in Beverly Hills are invited to schedule a personal consultation with Dr. Kotler. Call (310) 278-8721 today to take the next step for a nose you’ll love.